One of the places in Rome that offers the best views is the Sovereign Military Order of Malta, placed near the Orange Garden. Nowadays, you won’t find the palace, but you can find the huge green door that takes you to its gardens. If you look through its key lock, you will see that in the gardens of this building there is an arch form. The most striking characteristic about this place is the view of the St. Peter’s Basilica’s dome in the Vatican, which is perfectly aligned with the door. Don’t miss one of the most magic and romantic places in Rome. 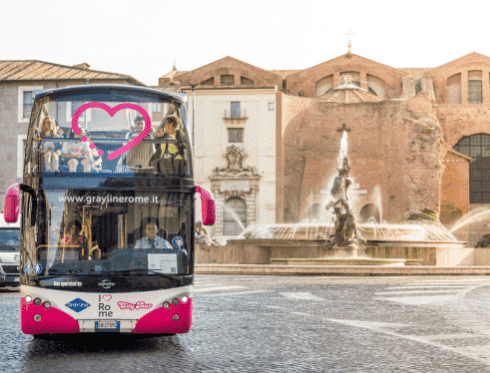 To get to this place, take one of Roma City Tour tourist buses and get off at the stop Circo Massimo of the routes Feriale and Festivi of our hop-on hop-off bus service. After visiting this place you can get on any of our buses and enjoy the panoramic views that they offer. With this combination, you will be able to boast because of having seen the most amazing views of Rome! 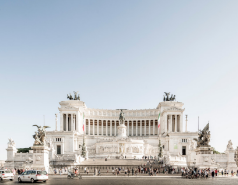 With Roma City Tour tourist bus, apart from gazing at the St. Peter’s Basilica from the Sovereign Military Order of Malta, you will be able to reach it. From the stop 6 of the routes Feriale and Festivi (Città del Vaticano) you will be able to arrive easily to the Basilica, and see, for example, the breathtaking Sistine Chapel of Michelangelo, which is in the Vatican. 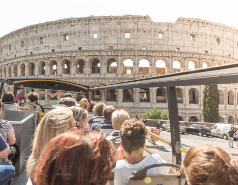 The tourist bus of Rome is an excellent option for transportation but it offers many other services. There are tickets of one tour, tickets of 24, 48 and 72 hours. This way, you will be able to design your trip at your own pace.